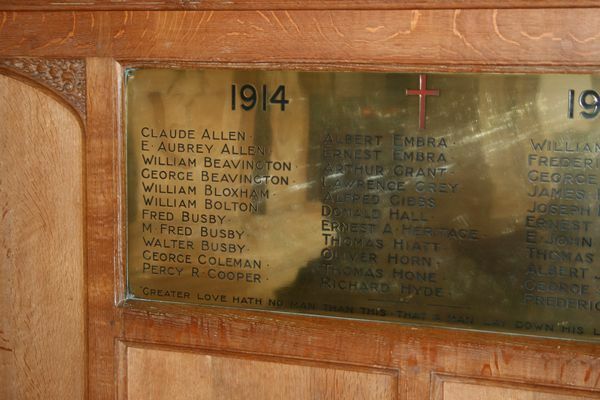 He was the son of Herbert and Frances Blanche Allen, The Bourne, Hook Norton. He was the son of Herbert and Frances Blanche Allen, Council Houses, Hook Norton. Private, 2nd Battalion, The Oxfordshire and Buckinghamshire Light Infantry, 60 Brigade, 20th Division. Army no. 8895. He was killed in action on 15 October 1915. He was 30. He was the son of William and Sarah Beavington of Hook Norton. He was the son of Leonard and Elizabeth Bloxham, The Grounds Farm, Hook Norton. He was the son of Benjamin Busby, Southrop, Hook Norton and the husband of Beatrice Kate Busby, High Street, Hook Norton. He was the son of Gertrude Pinfold (formerly Grant) of Hook Norton and the late Thomas Grant. He was the son of Samuel Gibbs, The Gables, Sibford Road, Hook Norton. 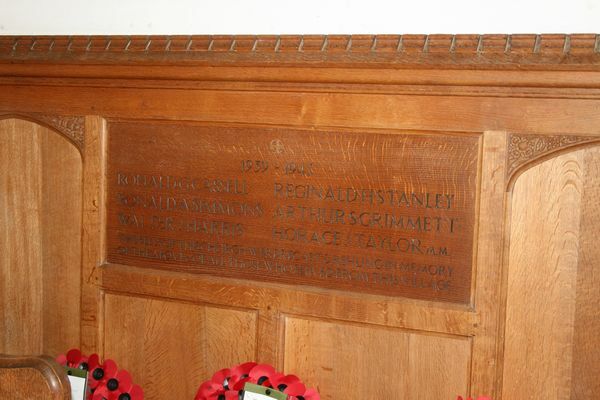 He was the son of John and Ruth C Hall, Queen Street, Hook Norton. 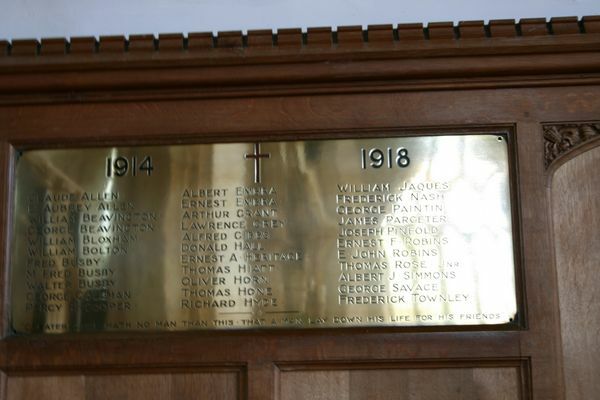 He is also remembered in St Edward's Church, Stow on the Wold. He was the son of John and Diana Horn of Hook Norton and the husband of Elizabeth Horn, 49 Sandown Road, Rugby. He was killed in action on 20 September 1916. He was 20. He was the son of William Phillip and Maria Jaques of Kaiwaka, Auckland. 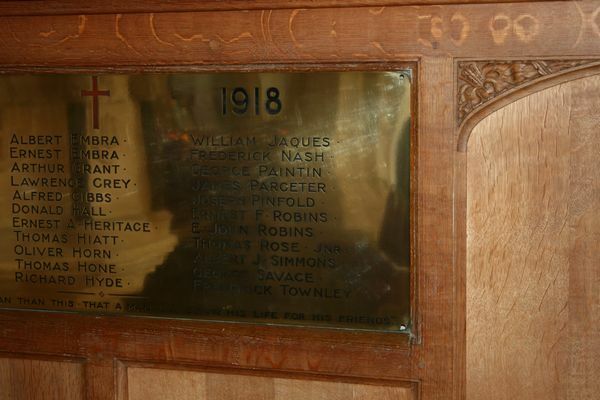 He was the son of Thomas Busby and Annie Sophia Nash, 26 Leopold Street, East Oxford. He was the son of George and Ann Pinfold. Private, 3rd Labour Company, Army Service Corps. Army No. He is buried in grave II B 18 Bois Guillame Communal Cemetery, Rouen. He was killed in action on 19 July 1916 at Fromelles. He was 30. He was the youngest son of William and Charlotte Townley of Hook Norton. He is remembered on panels 22 to 25 of the Loos Memorial. He was killed in action on 17 April 1918 in the fighting at the Lys. He was 19. 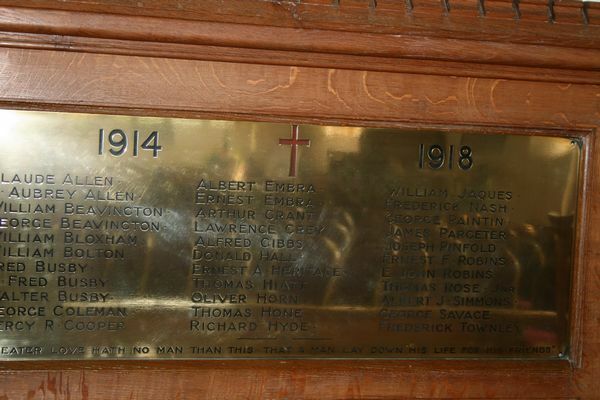 He is remembered on panel 68 of the Loos Memorial. He died from his wounds on 12 April 1918 received in the Battle of the Lys. He was 36. He was the son of George and Emma Bodfish and the husband of Sarah E Bodfish, Albert Cottages, Hook Norton. He was killed in action on 25 September 1915. He was 29. He was killed in action on 17 July 1916 on the Somme. He was 27. He was the son of Henry and Rachel Breakwell, Summerfield Lane, Hartlebury, Kidderminster. Devonshire Regiment, Army No. 37653. He was killed in action at the Battle of St Quentin on 22 March 1918. He was 28. He was the son of Thomas and Elizabeth 6 Milton Street, Banbury and the husband of Florence Cross (formerly D'Oyly), 2 Bourne Villas, Hook Norton. He died from his wounds on 9 April 1918. He was 32. He was killed in action on 24 January 1916. He was 20. He died of his wounds on 22 September 1917. He was 47. Oxford and the husband of Hannah Jane Robinson of Hook Norton. Buckinghamshire Light Infantry, 5 Brigade, 2nd Division. Army No. 8721. He was killed in action on 16 May 1915. He was 32. He is remembered on panel 26 of Le Touret Memorial. He died of his wounds on 8 April 1918. He was 34. Lance Corporal, Mounted Branch, Corps of Military Police. He died on active service on 12 September 1915. He was 50. He was the son of Walter G and Mabel E Cassell of Hook Norton. His unit was responsible for managing the Port facilities needed by the Allied Invasion Forces. He was the son of George William and Emma Harris of Hook Norton. Their Lancaster W4144 EM-U, was home bound on an operation to Essen when it was shot down by a nightfighter piloted by Hptm Manfred Meurer of I. /NJGIand. It crashed at 20.15 hours. One of the crew avoided capture, two became prisoners of war. 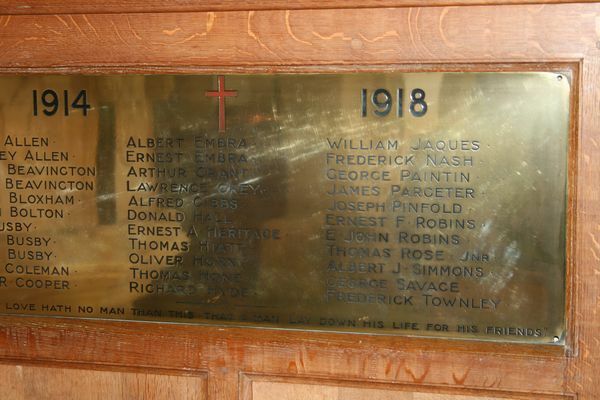 Those who died were: Sergeant W H Moger, Sergeant K H Pugh and Sergeant I W Lineker in addition to Walter Harris. Operation Varsity (24 March 1945) was a successful joint American–British airborne operation involving more than 16,000 paratroopers and several thousand aircraft, it was the largest airborne operation in history to be conducted on a single day and in one location. The role of the 1st Royal Ulster Rifles was to land on LZ-U to the south of Hamminkeln, capture a bridge crossing the River Issel, secure the Ringenberg Railway Station, and then take up positions in the surrounding area. Anti-aircraft fire was particularly heavy, and the Royal Ulster Rifles received more than most when their gliders came in to land. "D" Company, landing very close to the bridge in a coup-de-main capacity, rapidly gained their objective, despite numerous casualties and the absence of two of their four platoons. As they were attacking towards the Bridge, the Company was faced with the daunting prospect of five self-propelled guns approaching their position, however once one of these had been knocked out at very close range with a PIAT, the rest dispersed. "A" Company had been charged with the capture of the railway station, but as with "D" Company, only two of their platoons had landed on target. Nevertheless this force reached the station, encountering unexpectedly little resistance on the way, and discovered a platoon of the 12th Devonshires waiting nearby with a collection of fifty German prisoners who had been eager to surrender. This platoon was taken under command and the Company braced themselves for an anticipated counter-attack. This did not materialise, though three self-propelled guns did put in an appearance, but a wounding shot from a PIAT encouraged these vehicles in their clear intention of withdrawing without reply. "B" and "C" Companies were to secure the surrounding terrain, but fierce resistance in their sector of the landing zone resulted in high casualties. However, once the Ulstermen had located and begun to attack these positions, they found the will of the enemy to fight crumbled remarkably quickly and a considerable number of prisoners were taken. By the afternoon, the Battalion was in complete control of their area, but the day had been extremely costly with two hundred and fifty-nine casualties sustained. He was the son of Charles Taylor, 8 Highfield, Stoney Stanton, Leicester and the husband of Elizabeth May Taylor, Fair View Terrace, Keresley, Coventry. 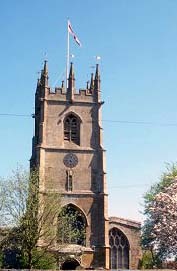 His reason for his presence in Hook Norton is not obvious unless he was convalescing in the area. Death was caused by drowning after he fell into the canal in Banbury on 17 March 1941. He was 42.